To a short film that deals with an extreme situation and how it affects an individual, a family and a society. It is a complex work that uses real documents and wonderful artistry to tell the tale of a woman who lived through hell on earth. We are astonished and moved by the heartbreaking story of the end of a culture in one fell swoop. And we are grateful for the moments of lightheartedness, real emotion and humanism that reverberate throughout the film. We have seen many films about this dark historic event, but never felt so strongly the horrors of the Hiroshima bombing from the victims’ perspective. A film that in the course of merely 14 minutes gives us a deep, immersive experience of life in the shadow of war. Sound and picture guide us fluently in and out of a dark history. The film is beating with the heart of the great cinematic tradition, and opens our senses to its protagonists – the people. A film that impressed us with layers of raw material from a few locations in different eras, weaved together with a mesmerising soundtrack. The archive material presents a view of the human condition at the height of the industrial age, which – by means of filmmaking – is revealed as surprisingly relevant to our day and age. A powerful depiction of mental illness and the afflictions of an affected family. A work of fiction can channel all kinds of worlds, and this film offers a son’s view of a father who struggles to discern between the real and the unreal. Overarching the two main competitions, and selected by the festival team. 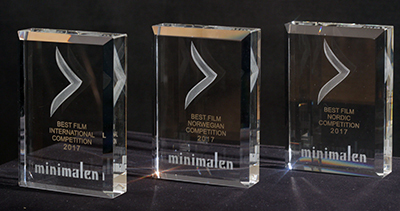 The award was established to celebrate the unique qualities of a compact, poetic short film that make use of the visual and auditive possibilities in an imaginative way, and do not follow the traditional feature film dramaturgy. This film brings the idea of an empowering inner voice to a truly unexpected level! Blending fiction and animation, this is a daring, visually playful, extremely entertaining exploration of female sexuality and the refusal to be defined by undermining standards of beauty. This is a deceptively simple film which, with a subtle and understated touch, conjures up universal themes of alienation, belonging and cultural displacement. With its quiet, nocturnal and meditative pace, this film manages to leave the audience the space to reflect about filling their own metaphorical hole. For how it combines a minimalist style with a captivating voice-over to transport us into the mind and body of a woman trapped by an eating disorder. An extremely personal, heartfelt and down-to-earth portrait of a filmmaker's journey to find his vocation which leads him to re-examine some key figures of his youth. For its mastery of cut-out animation to sensitively and imaginatively bring to life stories of troubled childhoods. For its inventiveness and surreal tone in capturing a character longing to break away from the often inhumane quality of a workaholic society. To be screened before a feature film at Trondheim kino for one month, selected by Trondheim kino. Den ultimate forfilmen skal være en appetittvekker på et stort format, men også en fullstendig historie og et kunstverk i seg selv. Årets vinner av Forfilmprisen klarer på mesterlig vis å nå publikum med en skjør og fin tone og si noe om den umulige kjærligheten. Ved bruk av få farger, men tydelige overganger fra lyset til mørket gir den både håp og forklaring på hvorfor det kan være så vanskelig å nå inn til hverandres innerste rom. Juryen ønsker å berømme idérikdommen, originaliteten og den uforutsigbare og dristige bruken av enkle virkemidler i årets vinnerfilm. Og ikke minst er vi glade for å se en film som tar opp uhyre viktige ting både i dagens Norge og fra den mest traumatiske delen av vårt land historie. At filmen føles for kort er for oss et godt tegn, for vi ønsker å se mye mer både om dette temaet og fra denne filmskaperen i framtida. To a dance film that is suggestive, intuitive and has found its optimal form and length. An original and well thought out concept, and shows overall strong craftmanship. The film displays individuals merging into an abstract, organic whole, giving it a meditative and undulating quality that can awaken a variety of associations within the viewer. To a dance film of high visual quality and production value. The selected props, costumes and location merge well with the choreography and the dancers' convincing expressions, and the concept comes to its own through the high quality of the production. The film is quirky, fun and a bit disturbing, and demonstrates unexpected elements, in a contemporary esthetic. Jury: Gina Sandberg, Jon Vatne and Per Fikse.